Button-front dress with shaped neckline and extended shoulders forming brief cap sleeves. Inset belt joins bodice and skirt. Side pockets. Optional trim. 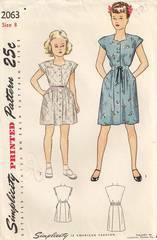 Vintage Simplicity sewing pattern 2063.